This form is a long term management agreement for a suburban office park with multiple buildings. This multi-year agreement specifically itemizes the duties and powers of the manager over such matters as general scope of management, rent collection, employees, relations with contractors and professional third parties (e.g., attorneys and accountants), maintenance and repairs, supervision of tenants, insurance, compliance with the law, payment of expenses, budgets, and leasing activities. The manager is compensated by payment of a percentage of gross income collected, plus payment of a construction management fee, plus the reimbursement of the manager's out of pocket expenses (including the cost of employee compensation and benefits) arising from its duties under the agreement. THIS MANAGEMENT AGREEMENT (this “Agreement”) is made as of ______, 20__, by and between COMMERCIAL OFFICE PARK OWNER, LLC, a ______________ limited liability company, (“ Owner ”) and COMMERCIAL OFFICE PARK MANAGEMENT ENTERPRISE, INC. (“ Manager ”). A. Owner is the owner of that certain property known as _____________________ and more particularly described on Schedule 1 attached hereto, together with certain office buildings (the “ Buildings ”) and other improvements (collectively, the “ Improvements ”), erected thereon (such fee simple interest and the Improvements are hereinafter collectively referred to as the “ Property ”). 1. Appointment.Owner hereby appoints and employs Manager as the exclusive managing agent for the Property upon, and subject to, the terms and conditions of this Agreement, and Manager hereby accepts such appointment. Manager shall manage, maintain and operate the Property in a manner consistent with that conducted of office building properties comparable in size, type and location to the Property and shall use reasonable diligence in all its endeavors. 2. Term.This Agreement shall commence on the date hereof and, subject to Paragraph 9 below, shall remain in full force and effect for a term of five (5) years through ______, 20__ (the “Term”); provided that if neither party terminates this Agreement by delivering written notice to the other party at least thirty (30) days prior to the then-existing termination date, this Agreement shall automatically renew on a year-to-year basis for successive twelve (12) month periods. 3. Manager’s Duties and Powers. (a) General Scope. Except as otherwise set forth herein, Manager shall manage, coordinate and supervise the conduct of the business and affairs pertaining to the operation, maintenance and management of the Property (collectively the “ Management Activities ”). The Management Activities shall be conducted (hereinafter referred to as “ Management Standards ”) (i) in a manner consistent with the existing character, condition and level of operation and maintenance of the Property, and (ii) with reasonable diligence under the circumstances then prevailing that a prudent person acting in like capacity and familiar with such matters would use in the conduct of an enterprise of like character and with like aims. Additionally, to the extent reasonably practicable, Manager shall conduct the Management Activities in a manner consistent with the requirements of any Leases (as hereinafter defined), mortgages, deeds of trust, certificates of occupancy, permits, licenses, consents or other recorded and unrecorded agreements (collectively, “ Key Documents ”) now or hereafter affecting the Property to the extent that true and correct copies of such Key Documents have been delivered to Manager. To the extent Manager is uncertain of its obligations under any Lease or Key Document, Manager shall have the right (if Manager has requested Owner to explain Manager’s obligations and Owner has either failed to do so or Manager, in good faith, disagrees with Owner’s interpretation) to engage legal counsel at Owner’s expense (within the limitations of the Approved Annual Budget (as defined in Paragraph 5 )) and to rely upon the advice of such counsel. Manager shall have no authority to and may not execute any mortgages or deeds of trust on Owner’s behalf. 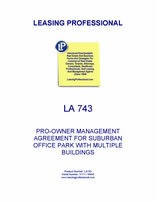 Unless otherwise instructed by Owner in writing, Manager shall have the right to execute Leases on Owner’s behalf, provided that such Leases are consistent with general leasing parameters approved by Owner and provided that Manager shall not without Owner’s consent execute any Major Tenant Lease under (and as defined in) that certain Operating Agreement of COMMERCIAL OFFICE PARK OWNER, LLC, dated ___________, 20__. Manager shall have such responsibilities, and shall perform and take, or cause to be performed or taken, such services and actions customarily performed or taken by managing agents of comparable office building complexes and as shall be necessary or advisable for the proper conduct of the Management Activities in accordance with the Management Standards, including, without limitation, the duties set forth in Paragraphs 3(b) through (o) below, subject, however, to the limitations set forth in this Agreement. Unless otherwise specifically provided in this Agreement, all services and actions that Manager is required or permitted to perform or take, or cause to be performed or taken, under this Agreement in connection with the Management Activities shall be performed or taken, as the case may be, on behalf of Owner and at Owner’s sole expense, and within the limitations of the Approved Annual Budget. (b) Rent Bills and Collections. (i) Unless otherwise instructed by Owner, Manager shall prepare and deliver to all persons, firms and entities occupying or using space in the Building(s) (individually, a “ Tenant ” and collectively “ Tenants ”) monthly bills setting forth all rent, escalation payments, common area maintenance payments and other amounts payable by such Tenants (collectively, “ Rent ”) under the terms of their respective leases or license, occupancy or similar agreements (individually, a “Lease” and collectively, “Leases”). Such bills shall be accompanied by such other information and materials as Owner is required to furnish such Tenants under their respective Leases. Manager shall use reasonable efforts to collect all Rent, but shall not seek to dispossess any Tenant or initiate legal action without Owner’s prior written consent. Unless otherwise instructed by Owner, all Rent, security deposits or other sums collected by Manager from Tenants shall be deposited in an insured account in the name of Owner. Notwithstanding anything to the contrary provided herein, Owner retains the right to require Manager to utilize a lockbox arrangement or such other arrangement mutually satisfactory to Owner and Manager. (ii) Manager shall take all such actions as Manager shall deem necessary or advisable to enforce all rights and remedies of Owner under the Leases or to protect the interests of Owner, including, without limitation, the preparation and delivery to Tenants of all “late payment,” default and other appropriate notices, requests, bills, demands and statements. Owner reserves the right, however, to direct Manager not to take any such actions or deliver any such letters. Manager shall have the right in its good faith discretion to retain counsel, collection agencies and such other persons and firms as Manager shall deem appropriate or advisable to enforce, by legal action, the rights and remedies of Owner against any Tenant in default in the performance of its obligations under a Lease, provided that, Manager shall not, without the prior consent of Owner, authorize the filing of any lawsuit against any Tenant or any other person in connection with any Lease or other matter relating to the Property. Manager shall keep Owner informed on a regular basis of the progress of all legal actions. (c) Employees. To the extent necessary for the conduct of the Management Activities, Manager shall hire qualified personnel who, in each instance, shall be employees of Manager (and not of Owner). Manager shall direct and supervise all personnel hired by Manager in the performance of their duties. If Owner is dissatisfied with the performance of any of Manager’s employees, Owner shall specify to Manager the cause of such dissatisfaction and Owner and Manager shall thereafter cooperate to amicably resolve to the mutual satisfaction of the parties hereto any concerns reasonably raised by Owner, provided that Owner shall not have the right to require Manager to terminate any particular employee. Manager shall use commercially reasonable care in the selection and supervision of all employees and, having used such care, Manager shall have no responsibility or liability to Owner or any other person for any act or omission, tortious or otherwise, of any employee. (d) Professionals and Contractors. To the extent Manager reasonably deems necessary in connection with the Management Activities, and unless otherwise instructed by Owner, Manager may (i) execute on Owner’s behalf written contracts with architects, engineers, accountants, attorneys, tradesmen and other independent contractors (collectively, the “ Third Parties ”) to perform services; (ii) supervise the administration and monitor the performance of all work to be performed and services to be rendered under all such contracts with Third Parties; and (iii) if Manager may lawfully do so, discharge and terminate the services of any one or more of such Third Parties; provided , however , that (x) any such contract having a term in excess of one year must be terminable by Owner on no more than 30 days’ notice without cause; (y) the nature and cost of the services to be contracted for are included in the then current Approved Annual Budget; and (z) any such contract with an Affiliate of Manager shall be subject to Owner’s prior written approval. To the extent that Manager is required by the next following paragraph of this Paragraph 3(d) to submit any service contracts for repetitive services (e.g., janitorial, landscaping, window washing) to competitive bidding, Manager shall so submit such contracts for competitive bidding no less frequently than once every three years. Manager shall use due care in the selection and supervision of all such Third Parties and, having used such care, shall have no responsibility or liability to Owner or any other person for any act or omission, tortious or otherwise, of any such Third Party.Manager shall submit any item of work or purchase (except in an emergency) to competitive bidding (i) upon the request of Owner, or (ii) if such item of work or purchase is reasonably anticipated to cost in excess of $20,000.00 whether or not such item is included in the Approved Annual Budget. Where competitive bidding is required pursuant to this Agreement, the following provisions shall be applicable:(i) A minimum of two (2) written bids shall be obtained if the contract provides for payments in excess of $20,000 and less than $30,000. Notwithstanding the foregoing, (x) contracts providing for payment in excess of $20,000 where one of the bidding parties has obtained two or more contracts from Manager providing for payments in excess of $20,000 within the previous 12 months and (y) contracts providing for payments in excess of $30,000 will, in either such case, require a minimum of three (3) bids. (ii) Each bid shall be solicited by Manager in a form intended to elicit uniformity in bid quotes. (iii) Unless Owner requires otherwise, Manager may accept any qualified bid without prior approval from Owner if the expenditure is contemplated by the Approved Annual Budget and will not result in exceeding the anticipated expenditure in the Approved Annual Budget for that work or purchase; provided , however , if Manager accepts other than the lowest qualified bid, Manager shall adequately support, in writing, its selection. (iv) Manager shall maintain adequate records of its compliance with the foregoing competitive bidding procedure. (v) The foregoing bidding requirements shall not apply to the employment or retention of consultants and professionals (nor shall Owner’s consent be required for such employment or retention) to the extent such expenditures are in accordance with the Approved Annual Budget. (i) Manager shall cause the Property to be maintained in a manner consistent with the Management Standards. (ii) To the extent of the capacity of all equipment and systems located in or servicing the Property, and to the extent that funds are provided by Owner, Manager shall cause all such equipment and systems to be operated effectively and maintained in good repair and in a manner consistent with the Management Standards, and Manager shall cause to be provided or made available to Tenants those services which Owner is required to provide or make available under the Leases. (iii) Unless otherwise instructed by Owner, Manager may execute on Owner’s behalf such service and maintenance contracts as shall be necessary or appropriate for the operation and maintenance of the Property in a manner consistent with the Management Standards and the requirements of Paragraph 3(d) above, including the equipment and systems located in or servicing the Improvements (including, without limitation, contracts for utilities, telephone service, window cleaning, landscape maintenance, rubbish removal, fuel, security, food vending and vermin extermination). Manager shall purchase, pursuant to an Approved Annual Budget or as otherwise approved by Owner, all supplies, materials, tools and equipment as are necessary or appropriate for the operation and maintenance of the Property in accordance with the Management Standards. All such supplies, materials, tools and equipment shall belong to and shall be the property of Owner and may be used only for the benefit of the Property. (f) Repairs. Manager shall cause all repairs to be made to the Improvements and all equipment and systems located in or servicing the Property and, pursuant to the terms of the Leases or as otherwise approved by Owner, shall cause such interior alterations and decorations to be made to the Improvements as are reasonably necessary or advisable for the operation and maintenance of the Improvements in accordance with the Management Standards. Notwithstanding the cost limitations set forth in Paragraph 4(a) of this Agreement, Manager may cause to be made all repairs which Manager believes in good faith are immediately necessary for the preservation or protection of the Improvements or the safety of Tenants and other persons in or on the Improvements, or are otherwise reasonably required to avoid the suspension of any necessary services in the Building(s) without Owner’s prior approval and without being limited by the Approved Annual Budget (but Manager shall use commercially reasonable steps to effect such repairs in a cost effective manner given the circumstances); provided , however , that in each such instance Manager shall, before causing any such emergency repair to be made, use reasonable efforts under the circumstances to notify Owner of the emergency situation and obtain its approval of such repair. If Manager cannot notify Owner of the emergency situation before commencing the emergency repair, it shall notify Owner of the emergency situation and the repair made to correct it as soon as reasonably possible thereafter.